The Jeep Wrangler Wraith is ready for rock spitting, dirt slinging, action. It's designed to tackle the rocks with ease and blast across open desert at full attack speed. The bottom line, the Wraith is tough as nails and prepared for any terrain. 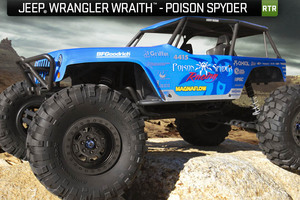 The Jeep Wrangler Wraith - Poison Spyder 1/10th Scale Electric 4WD Rock Racer features a realistic full tube-frame chassis design that is manufactured with high strength composite materials. The Wraith IS BUILT TO GO FAST and is not just a low speed rock crawler. The Jeep Wrangler Wraith is built with traditional straight axles allowing for maximum suspension articulation. This vehicle features differential lockers front, center and rear just like its full size counterpart. With lockers and maximum articulation, there isn't anywhere you can't take this rock racing machine! Officially licensed Trail Ready HD Series beadlock wheels dressed in an aggressive all black style are easy to assemble and they work with most 2.2 tires. The hub design allows this wheel to mount to any Wraith, AX10 Ridgecrest or SCX10. Our IFD (Interchangeable Face Design) wheel system makes it easy to dress it up with a new look. Serrated wheel nuts provide plenty of bite to keep the wheel securely in place and they're anodized blue for great looks! Officially licensed BFGoodrich Krawler T/A KX tires! In the full-size offroad world, they are the winner of more rock-crawling championships than all other tires combined (Race spec tire, Years 2004 through 2008). The Axial version captures the same aggressive look youve been waiting for. Finding the right spring rate can be tough. Axial made it easy for you by including what we found to be the right balance of high speed and harsh terrain handling. The softer spring rate keeps the Wraith on course and ready for your next obstacle! The skid plate protects the transmission and other critical components while providing a flat surface to help the Wraith slide over rocks or other obstacles. Our partnership with Jeep continues with an officially licensed Jeep Wrangler body, wrapped in officially licensed Poison Spyder graphics. Trim dials for fine tuning steering and throttle centers. Battery indicator light lets you know when your transmitter batteries run low.